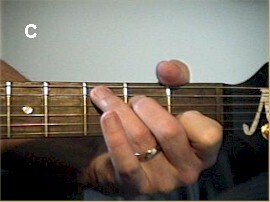 Lyle: In the past few lessons you learned simple 1 finger chords. Now it's time to learn some real chords! Lyle: This lesson is about the 5 basic chords you should know; A, C, D, E, and G. These 5 chords when played down in the open position all have unique shapes to them that you'll use later on to play what's called "moveable bar chords" all over the neck. The main thing to do in this lesson is to get good at playing these chords, memorize their name, their sound, and their shape. These 5 chords are used in thousands and thousands of songs. Lyle: Make sure each of the notes in the chord ring clearly. The circled note (highlighted) is the root note, A.
Lyle: Use all down strokes. 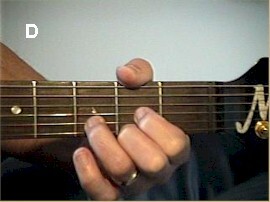 Play the A chord like I did in the video. You can loop the TAB file so you can play along with me. Notice in the TAB file you can hear me counting out loud the beats, try doing this with me too. 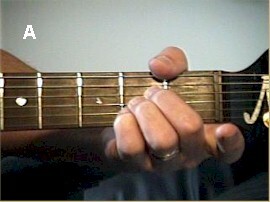 Lyle: That is the A major chord played in the "open position" meaning down low on the neck and with open strings. Lyle: Remember, you can loop the TAB file to play along with me, and you should count out loud with me too. Lyle: You can use the looping jam track of just the drum beat to practice playing this progression. Keep repeating it over and over until you can make the changes real smooth and stay on the beat. Count out loud which helps most of the time. Lyle: Notice the A and C chords have unique shapes to them. Visualize the shapes and fingerings to help you memorize them. Lyle: Once you can play these three chords as in chord progression 2, it would be time to learn the 4th chord of the lesson, the E chord. 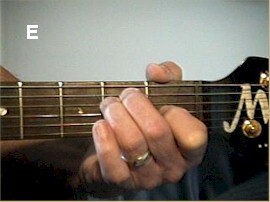 Lyle: Notice each chord has it's own unique shape. Lyle: I'm having you use this rhythm pattern to help you memorize the root note for each chord. Lyle: I like using the 1st, 2nd, and 3rd fingers to make this chord...most of the time. When you have to play a song that goes from G to C to G to C all the time, then I would use the other fingerings because it makes it quick and easy to switch back and forth. Lyle: Each chord gets two measures then repeat. Here's a jam track that has "the band" playing this progression. You should keep practicing until you are able to play with the band several times over and not miss a beat!